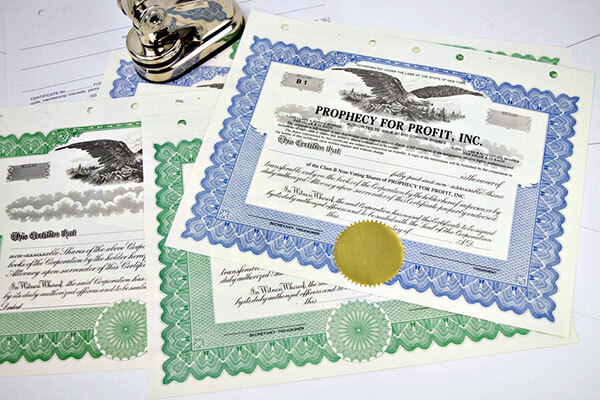 What is the difference between stock certificates and ownership certificates? The financial value of a corporation is its stock (called shares in New York). It may be contributed by its original shareholder(s) for money, goods or services, or raised by selling shares to others. A corporation is authorized by its organizing documents to issue a certain number of shares, sometimes for a predetermined value for each share (“par value” shares) and sometimes for an unspecified amount dependent on values determined by the organizers, or later the market rate at the time the shares are sold (“no par” value shares). Owners of the shares of a corporation are given share certificates, which are physical paper certificates representing the number of shares of the corporation owned. The form of the stock certificates must be adopted by a resolution of the shareholders preserved in the minutes of the corporation. More than one class of shares may be authorized in the incorporating documents. The “common shares” enables the owners to vote at shareholder meetings, receive dividends and a share of the assets on dissolution. Common share may be divided into classes. The right to vote and receive dividends and share in the assets at dissolution may be divided among the classes. The laws of each state determine what the language of each certificate must state and must be strictly observed. “Preferred” shares may be authorized. Preferred shareholders may be entitled to a fixed dividend, a preference in dissolution, or other preferences over the “common” shares. The laws of each state determine what the language of each certificate must state. Limited liability Companies (LLC’s) issue ownership certificates, as well. They may be units of membership interest indicating that the certificate holder is a member of the LLC; percent certificates which indicate the percent of ownership of the certificate holder, or representative certificates (rarely used). LLC certificates may also be divided into several classes. The operating agreement of the LLC will explain the features of the specific certificates issues by the LLC. Previous PostPrevious What Does “Publish Your LLC in New York” Mean? Next PostNext What is a blueback?